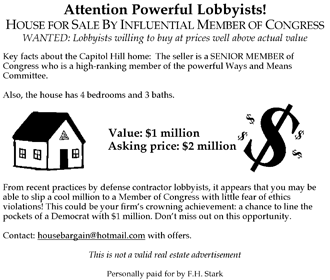 Defense Contractor Mitchell Wade, in a sweetheart deal, secretly bought Duke and Nancy Cunningham’s Del Mar Heights house November 20, 2003 for $1,675,000. They hid the sale through a shell corporation of Wade’s, “1523 New Hampshire Avenue LLC.” A month later, Wade put it on the market, but it didn’t sell until the price was reduced to market value, eight months later. Wade sold Cunningham’s old home for $975,000. Since home values haven’t gone down recently in San Diego, it seems Wade gave Cunningham $700,000 (not a campaign contribution, but apparently an illegal gift). Wade never moved in there, as he and his company, MZM Inc. are in the Washington, D. C. area and don’t do business in San Diego. 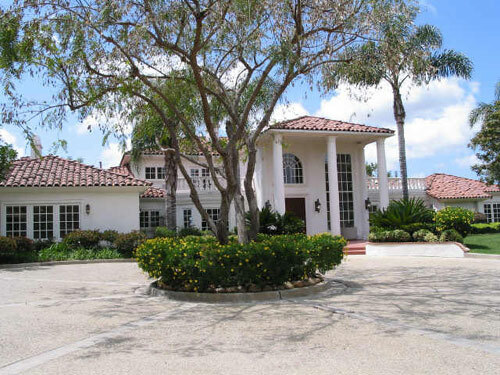 Cunningham bought his Rancho Santa Fe mansion for $2.55 million. 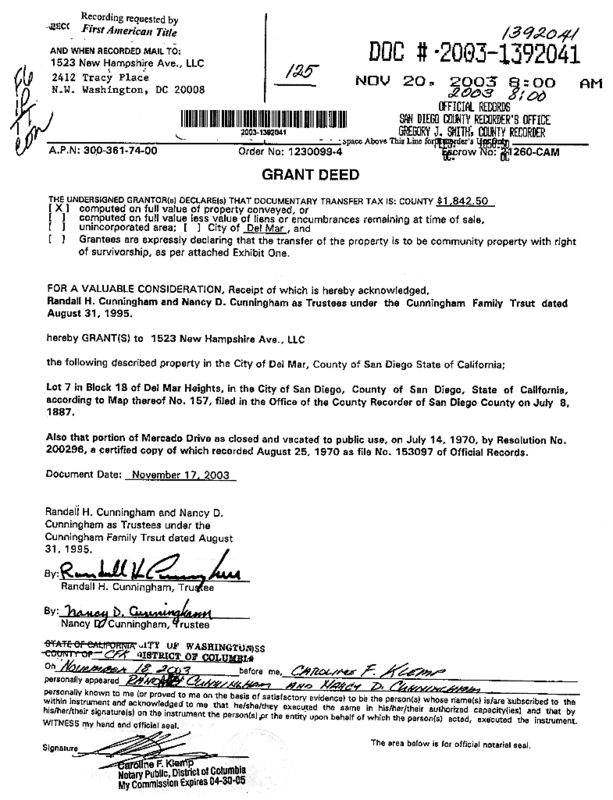 Shortly later, Cunningham had Brent Wilkes pay his second mortgage on the Rancho Santa Fe Mansion and Wade pay the first mortgage. In exchange, it appears Cunningham helped Wade get contracts for his MZM Inc. ($41 million in fiscal 2003, $65 million in 2004) to triple MZM’s profits in 2004. Cunningham says the contracts are “very, very classified” stuff, so he can’t talk about it. Wilkes gained $6 million in defense contracts for unwanted hardware worth $1.5 million In short, these were war profiteering bribes. Here’s a photograph of Duke and Nancy Cunningham’s old home on Mercado Dr. in Del Mar Heights. The 3826 sq. ft. home (big, but not a mansion) was sold to defense contractor Stephen Wade’s shell corporation for $700,000 over its market value [map]. First one taken by me (Dan Anderson) 6/17/2005. Photos of Cunningham’s 7628 sq. 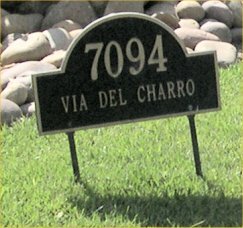 ft. home at 7094 Via del Charro, Rancho Santa Fe. Taken by me (Dan Anderson) 6/18/2005. [map] [Satellite photo map]. [Assessor’s Map] See also article and photo of a protest near Cunningham’s home (6/17/2005) (S. D. Union-Tribune’s SignonSanDiego.com). KUSI has protest photos and aerial shots of the house. 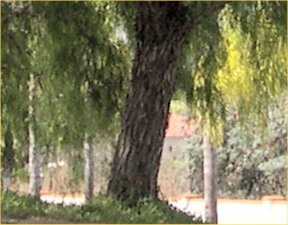 down the street (Northern view). Entrance is on the left. 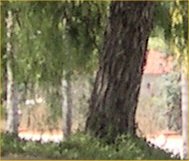 The following public records are searchable online from the San Diego County Recorder and the searchable online County Assessor records. 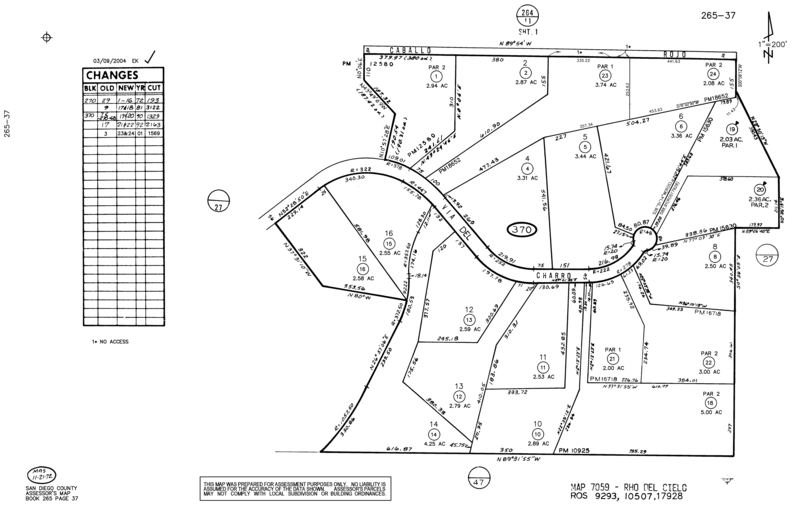 These are concerning Cunningham’s sale of his 3826 sq. 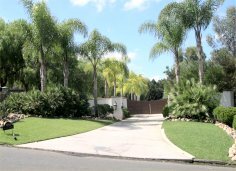 ft. Del Mar Heights home on Mercado Dr. [map] to defense contractor Stephen Wade for $700,000 over its true worth. 1/20/1988: Cunningham buys Del Mar Heights home for $435,000 (1988-0024671). 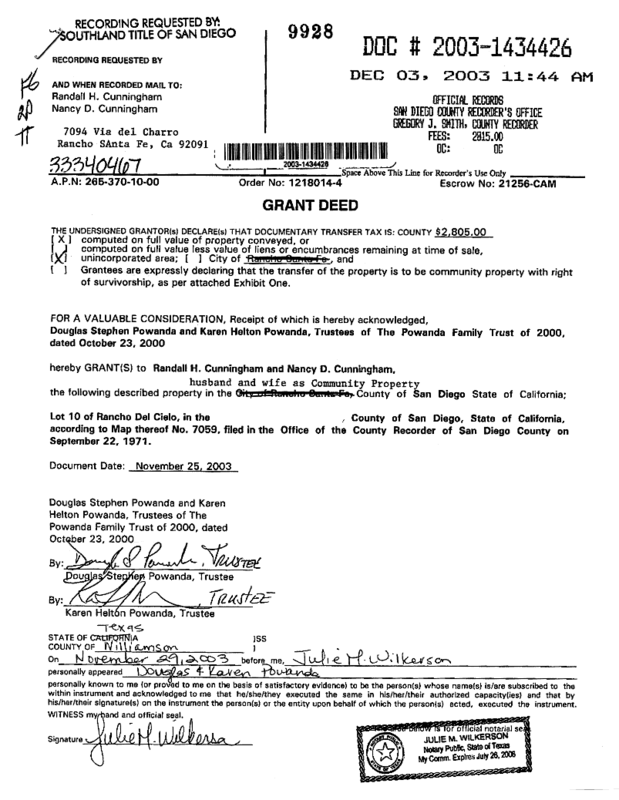 11/20/2003: Cunningham sells his home to Wade’s shell corporation "1523 NH Ave. LLC," (2003-1392041). Sold for $1,675,000. 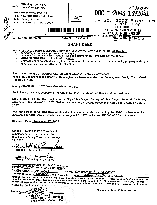 10/13/2004: Sale by Wade, through his shell corporation, 1523 New Hampshire Avenue LLC. of Cunningham’s old home, 261 days later (2004-0973682). Offered for sale for $1,680,000 less than a month after Wade purchased it, but it didn’t sell until the price was lowered to market value ($975,000). 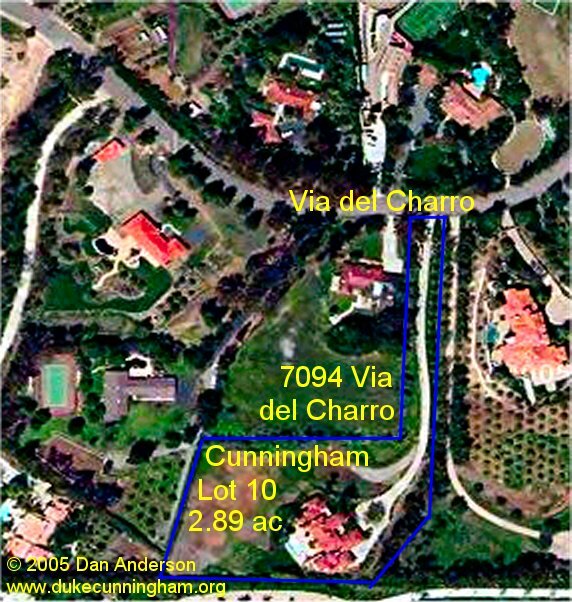 12/3/2003: Purchase of Cunningham’s home in Rancho Santa Fe (2003-1434426). Bought a 7628 sq. 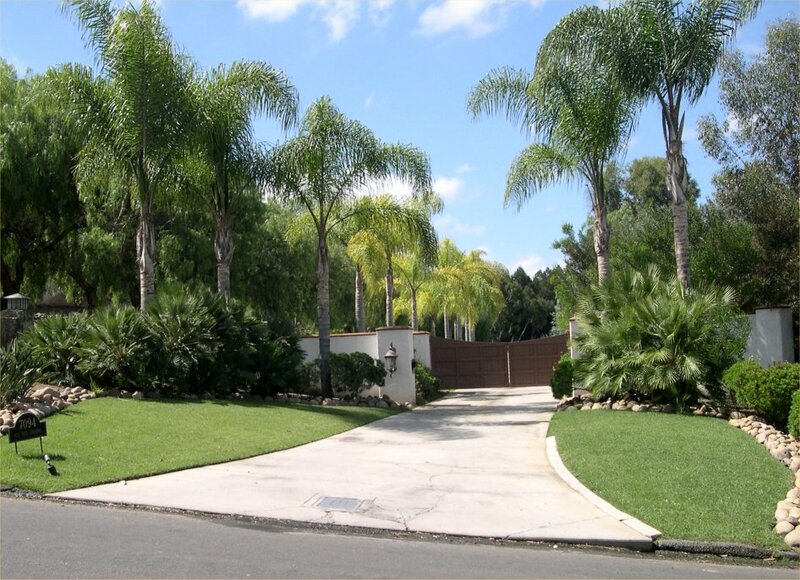 ft. home on a 2.89 acre lot at 7094 Via del Charro [map] for $2,550,000 from Douglas Powanda, former VP of Sales for Peregrine Systems Inc. (Powanda was indicted for accounting fraud October 2004. Peregrine Systems is not related to Cunningham contributor Peregrine Semiconductor). 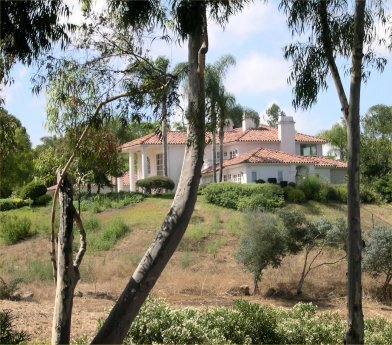 It appears that the purchase price of the Rancho Santa Fe home may have been below market (comps). 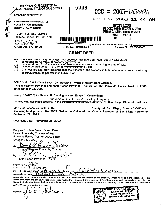 2004 property taxes were $26,763.04 (Property Tax payments for parcel 2653701000). Commentary by Union-Trib columnist Logan Jenkins (6/16/2005), reader reaction (6/18), and commentary on Cunningham statement (6/27). NBC channel 7/39 (KUSI) story. Includes an interesting slide show of the Del Mar and Rancho Santa Fe homes with aerial photos. 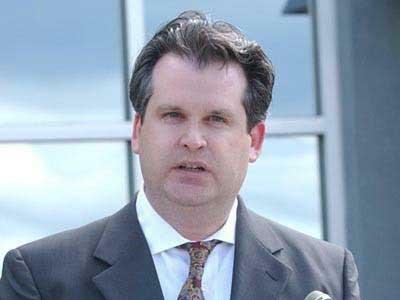 Jeffrey Birnbaum & Renae Merle of the Washington Post (6/17/2005) found Wade funded and created “The Sure Foundation.” Cunningham’s wife & daughter are on its Advisory Council. The Sure Foundation used to have a PDF newsletter with pictures of Wade & Cunninghams at a party, but it has since disappeared from the website (June 2005). William Bennett of the NC Times reported on 6/17/2005 that Cunningham’s subcommittee authorized a $100,000 grant to The Sure Foundation. More details on The Sure Foundation. 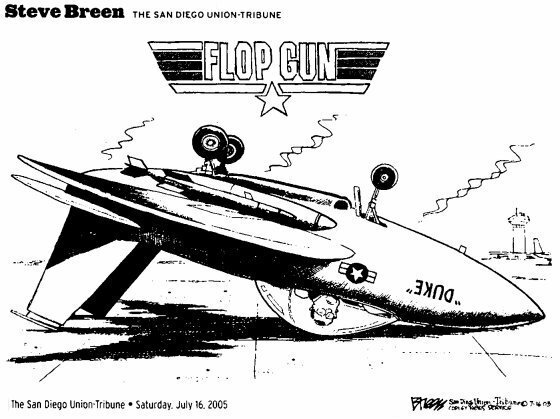 Federal agents raid Cunningham’s Rancho Santa Fe mansion, Duke-Stir yacht, MZM, and Wade’s home (Joe Cantlupe, Union-Trib, 7/2/2005) NC Times article shows FBI cars leaving Cunningham's home. Government Sentencing Memorandum and letters of support for Cunningham (North County Times 2/18/2006). Link to defense response in Union-Tribune article, 2/18. 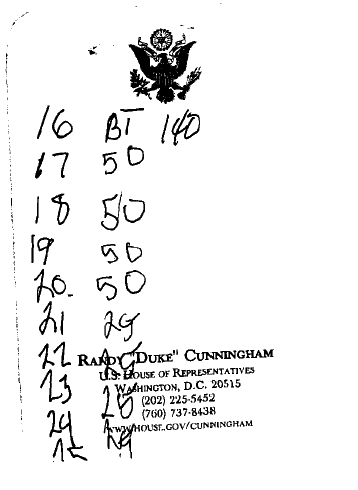 Cunningham Scandal could widen to Congressional memo (TPM, 8/10/2006) More details at Union-Trib, 8/11/2006. Nancy Cunningham, Duke's wife, interviewed by "Kitty" Kelly in The New Republic, 8/26/2006 (registration required). 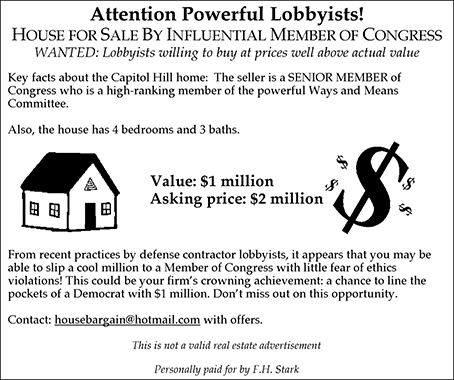 Excerpts at TPMmuckraker and NC Times Commentary by Logan Jenkins (U-T, 8/24/06). Duke Cunningham prison letter blames Michael Wade, "tabloid" Union-Tribune, and reporter Marcus Stern for downfall (U-T, 10/7/06) Full text of letter. More news keeps on coming. For the latest, go to Google, click on NEWS or click this link. Tell us what you think or about any more information you’ve found: post a message. Or read other people’s messages. Copyright © 2005-2012 Dan E. Anderson. All rights reserved.